It took me a long time to want to talk about this book. I mean, two other friends were reading it simultaneously and we would discuss as we went, but to non-vegetarians, this book gets into the topic territory I try to avoid getting too political on. This book is about factory farming. The best (in my opinion) reason for going vegetarian is to avoid supporting factory farming. It’s a subject you can be passionate and emotional about, or level-headed and rational about, because there are facts, and there are singular stories, that make up for the true horror of the business. And yet people don’t know about it. My friend Dustin summed it up brilliantly when he said – they do such a good job keeping people in the dark. “They” being.. corporations? The industries who influence politicians? Our families who raise us, who kind of know but chose to not know? And also traditions and family culture, that one cannot separate food from being social. 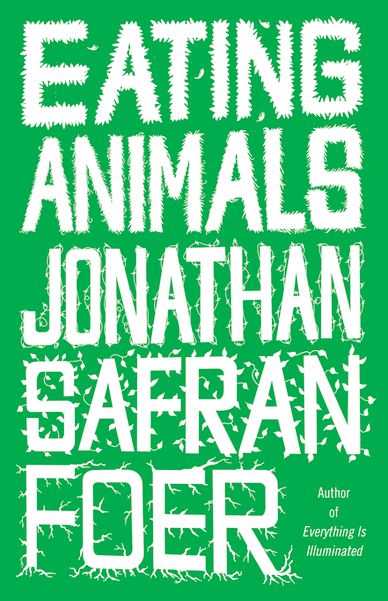 This book is written by a young man (Jonathan Safran Foer, a favorite) whose story mirrors mine. Stints of vegetarianism until something finally clicked. Who for the sake of his family decided to investigate animals-as-food culture and how it’s evolved (well, devolved) to the state it is in, why we don’t know the truth, and most importantly, what the truth is. This book will piss you off. About our gluttonous culture, that allows factory farming to be what it is. About the industry, that will cut corners at the expense of animals and consumers. In my case it made me feel empowered by my decision, guilty about my past blissful ignorance, and confused about what I can possibly do about it. I blogged about The Kind Diet, which was written in a “you can change the world” tone. Empowering in its simplicity. Eating Animals didn’t offer the same happy hippie vibe. Occasionally, it offered glimmers of hope. Hope for movements toward, if not a vegetarian society, at least a backlash against commercial farming. But it’s statistics of GROWING meat consumption, SHRINKING small business representation, and the predictions for a bleak future (assuming we keep on trend) was heartbreaking. I am still feeling like it’s hopeless; our only hope is through knowing and taking action. Which is why I am fence sitting on discussing this book in much detail with anyone – it’s a topic I feel so strongly about and a book both so impactful and depressing, I couldn’t bare the thought of someone reading, and dismissing, the message, even if it is simply out of a desire to not know. That said, I want the world to read it. I want the world to be angry. And to separate not only their taste preference, but even their life’s assumptions – what they think they know- for a moment. And really think. What do you know, and what is merely a justification? It hurts, but it matters. It’s on my to-read list. I still eat meat, but only when it comes from local sources. We don’t eat meat at home more than once a month or so, and I rarely eat meat out. I think the more I knw, the jokes I inch toward vegetarianism. I’ve become really passionate this ear about buying food from local sources or at least good sources and I’m enjoying eating so, so much more. I’m really excited, if maybe a little scared, to read Eating Animals after reading this post. It’s a fantastic read and will if nothing else, solidify your choice to look for sources of responsible meat production. kudos to you for that! i think if everyone cut back and viewed eating as something requiring awareness, it would fix so many problems. not just the ethical treatment of animals, but the health of our country. this stuff matters a lot.